Panelists in the Charles Beard Room discussed using creativity to create community. Jabari Asim was one of the main organizers of the event. Continuing its efforts to become more culturally competent, Emerson hosted a day-long conversation about race on Friday in the Cutler Majestic Theater. The goals of the Teach-In on Race were to enhance student, faculty, and staff understanding of race, particularly in the U.S., President M. Lee Pelton said at the event. “We know that our college is not an ivory tower,” Pelton said at the event. The Office of Academic Affairs and the President's Office sponsored the event, in coordination with the Office of Diversity and Inclusion. Jabari Asim, associate professor of writing, literature, and publishing, organized the Teach-in on Race. Asim said that he talked about an event like this with Provost Michaele Whelan following student protests in Spring 2015. As a co-chair for the ad-hoc Cultural Competency Committee, formed in the wake of the student demonstrations about the treatment of minorities and the lack of diversity at Emerson, Asim began planning the event. “I don’t think we would have arrived at those conversations without the students having sparked them,” Asim said. After deciding to hold a teach-in about race, Asim reached out to Nathaniel Charles and Lucie Pereira, co-chairs of Protesting Oppression With Educational Reform (POWER), for insight. Eddie Glaude Jr., chair of the Center for African American Studies at Princeton University, presented a keynote speech to kick off a day full of events about race on Emerson’s campus and beyond. Glaude said that racism today comes from how we perceive race: there is a value gap between white people and all other races. “The value gap has its roots in the fact that we are really more concerned about the image, the assumptions, the stereotypes, and the generalizations of these folks as opposed to these folks, these human beings,” Glaude said. He said this deep-seated racism hinders the democratic process, which can only be overcome by broadening the understanding on race. Conquering this injustice together, he said, is what democracy requires. When asked by an audience member how young black men can break through the stereotypes of becoming an athlete or entertainer, Glaude called them to action. 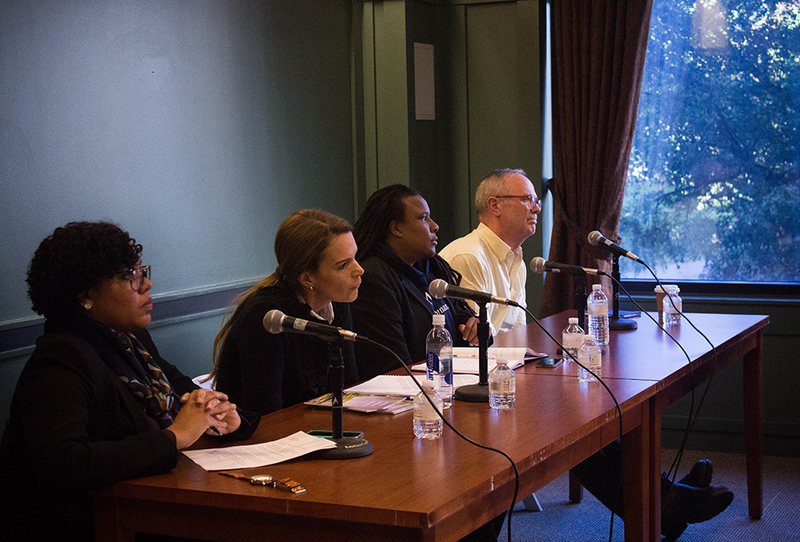 Seven panels followed the keynote speech, featuring Emerson faculty, students, and staff along with visiting faculty, activists, artists, and writers. Nathaniel Charles moderated a panel about crime and punishment, which explored police relations with minorities and the high incarceration rates for people of color. Artful Change, a conversation that explored the question of whether art is free creativity or if it can be used as a tool of progress, featured voices from various artists, including Terry Marshall, founder of Intelligent Mischief, an art focused activist organization. Marshall said he puts on creative events for the broader community to further understanding of black culture through art. Freshman visual and media arts major Abby Langton said she saw the value of using art as a vehicle for change. “Using art to point out and further a message is most helpful when coming into being an artist, having point of view and actually making a difference rather than just making art for art’s sake,” Langton said. Another panel explored intersectionality, a discussion about the interconnected nature of identities such as race, gender, and sexuality that overlap and can create systems of discrimination. The other events included a screening on race and identity in American sitcoms, discussions on using creativity to bring people together, a lesson on how to become an activist, and a discussion on the crisis facing the casting of minorities in media and theater. Event coordinator Asim said he is happy with how the events drew the attention and passion of the Emerson community. “While I think that we should continue to do the teach in, I hope that it will be a small part of many efforts that we make on every level of the Emerson community,” Asim said.